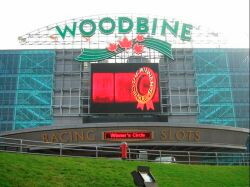 The synthetic revolution will be televised, and that is only if you have access to Woodbine. The track is a good value place, and the riders and barns are second to none. Victor Lebron in the saddle, and Mike Maker (22%) brings him to the paddock. Blinkers on, and that is a sign the trainer is fine-tuning his runner when they are up for a nice purse. Been off since the Virginia Derby and facing the double tough Paddy O’ Prado. I see this horse rolling them down about the 1/8th pole, and has been facing much better. Today is welcome break. Patrick Husbands for Mark Casse (15%) and they are 4/6 at Woodbine. A beaten favorite last out, and that is one of my favorite angles to come back and play. The rail holds a good place for winners, and should be up close. The jock change from Fraser to Husbands is a solid move, and it should be noticed right before they enter the winner’s circle. Eurico DeSilva in the irons, 21% a winning rider. Blinkers are off, comes in 2nd time off a layoff and was a beaten favorite. 2/2 at Toronto, and draws the rail. No matter what happens in the race, it has most all of the angles I use when finding runners. Eurico looks like he has a natural hand on synthetic, and I really like him today. Excellent handicapping in the Ontario Derby. You were one of the few who got it right. Congratulations, Stately Victor!